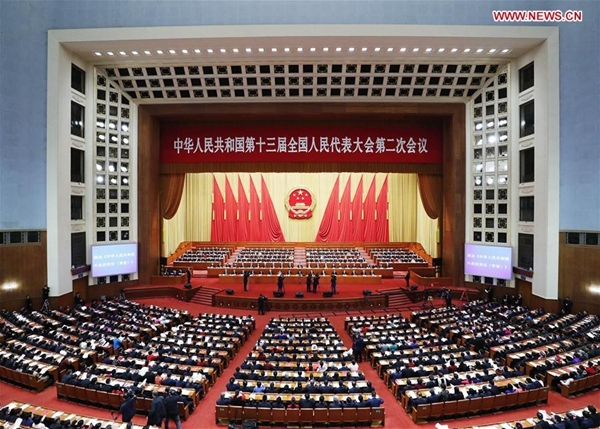 The second session of the 13th National People's Congress (NPC) came to a successful conclusion in Beijing on March 15. Some of the oft-heard phrases from the final assembly were: looking ahead to 2019, ensuring stable employment, ensuring the well-being of the people, opening up wider, and pursuing innovation-driven development. These send a message to the world: Despite changes in the international landscape, China remains unchanged in its commitment to opening up and development. "To secure a better life for the people" and "to follow a people-centered development philosophy" were tenets reflected in the government work report. Delivered by Premier Li Keqiang, this year's work report directed governments at all levels to carry out an austerity plan and use all means possible to raise funds and ensure higher quality of life for the people. Meanwhile, taxes will be reduced further. Inclusive tax reduction and structural tax policies will be implemented simultaneously to ease funding shortages faced by the manufacturing industry and by micro- and small enterprises. Heavier investment will also be made into chief industries and key links. The government will take tough steps to forestall and defuse major risks, carry out targeted poverty alleviation, and prevent and control pollution. It will guide enterprises to increase investment in scientific and technological innovation, to upgrade the level of industrial chains, and to enhance the financial system's ability to better serve the real economy. The Foreign Investment Law of the People's Republic of China was formally adopted at the closing meeting of the second session of the 13th NPC. Statistics show that China used US$135 billion in direct foreign investment in 2018, with the number of newly established foreign-funded enterprises increasing by nearly 70 percent. These numbers mean China has become the world's largest recipient of direct foreign investment. Adhering to the policy of opening up to the outside world, China has continuously broadened its "circle of friends." At a press conference on March 8, State Councilor and Foreign Minister Wang Yi announced that the second Belt and Road Forum for International Cooperation will be held in Beijing in late April. It is the most important diplomatic event China will host this year, and an international gathering that will capture the world's attention. The government work report also specified that backing of science and technology must be enhanced, including boosted funding for basic and applied research, and greater support for research in core technologies. China will establish and complete a technological innovation system that combines the forces of industries, universities and research institutes, with enterprises playing the leading role, according to the government work report. Other issues, such as bolstering research into technology "bottleneck" points, and pursuing innovative growth and commercialization of R&D results, were also key topics at the 13th NPC. Luo Jun, president of Sun Yat-sen University and a deputy to the 13th NPC shared that the government has strategically strengthened guidance for basic scientific research and increased investment in this field. The approach, he said, will lay a solid foundation for China to make significant further progress. Lei Jun, the CEO of Chinese smartphone maker Xiaomi and a deputy to the 13th NPC, said that enterprises should use the benefits and dividends obtained from tax and fee cuts to further increase investment in R&D, to improve the quality of manufacturing, and to build up a competitive edge. Ding Lieyun, an academician of the Chinese Academy of Engineering and a deputy to the 13th NPC, said that talent is the core component of science and technology competition. As ever, China is standing its ground. It will continue pursuing progress while ensuring stability and steady development. Following pragmatic methods, the country has found a path of development tailored to its national conditions. By its own strength, great courage and steadfast resolution, China is moving closer to center stage of the world. The just-concluded NPC session sent a message to the world: Despite changes in the international situation, China's commitment to opening up and development remains unchanged.